I have almost lived in Portsmouth for a year now and it may come as a surprise to you but I have never been to Pie and Vinyl. I can hear the gasps of a hundred local residents. My friends always asked me why I have never been and tried their legendary pies. I always shrugged in response. I got the impression from their reactions that it was in league with the Historic Dockyard as a tourist destination. Obviously, I knew Pie and Vinyl were a record label before I went and have been to their gigs and stages before at events such as Southseafest. From my experiences of those I can say that they certainly know their stuff but what else would you expect from a significant part of Portsmouth’s music scene? But, music aside, does their food live up to the same reputation? Pie and Vinyl is a small shop on Castle Road and normally when I walk past, every table is full. No surprise there when their food is meant to be fantastic and there are only 9 tables. On a Tuesday at 1pm, I managed to find myself a seat amongst the cooky interior of this much-loved café. The walls are covered in vintage items from board games to toys and dolls. Rustic lampshades hang from the ceiling as well and the tables and chairs are a mix match of wood and coloured plastic. On the opposite side of the shop is their record store with aisles of newly printed, pristine vinyls and cassettes and their own merchandise of hats, shirts and bags. Their menu, although only has pies and quiches, is quite extensive with lots of options to customise your meal. 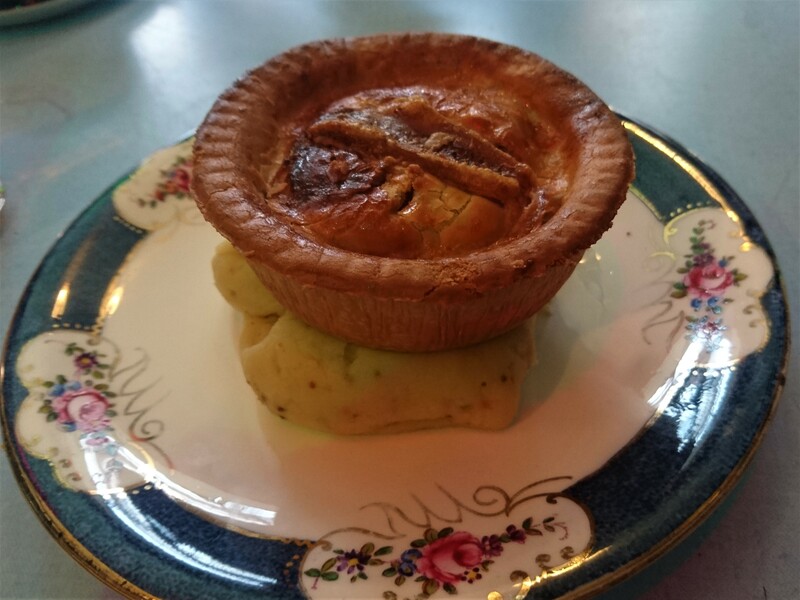 You can choose to have just one pie or two and all the ingredients are sourced locally and are homemade which is always welcome here. They sell many vegan and vegetarian options with impressive flavours such as butternut squash and spinach. Meaty flavours include double cheeseburger in the Fat Cat pie or Thai spiced fishcakes in Hot Hot Head. They were adventurous and unique and I loved that. Their drinks menu two-sided, having a large range of affordable hot and cold drinks. Included in this is their cordials from Mr Fitzpatrick’s vintage and Victorian range. 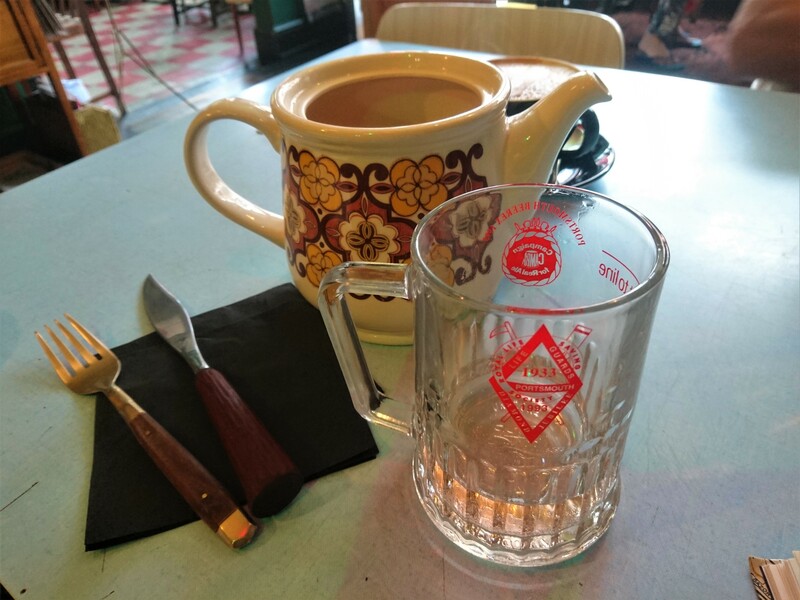 They are served with a choice of still or sparkling water in a tea pot and come in over 16 flavours. I ordered the strawberry and kiwi and was shocked with how much drink I was given. I filled three glasses! The coffee is locally brewed and apparently has hints of caramel and blueberry aromas. The tea comes as loose leaf with a timer to make sure you leave it for the best flavour. The hot chocolate comes with complimentary marshmallows. After ogling the drinks menu for so long I ordered a Porksea Islander pie with mustard mash and wavy gravy. One problem I found with the menu, regardless of the large range of drinks and vegan pies, was the disappointing range of sides. With your pies, you can have a choice of two sides such as mustard mash or mushy peas and, although I liked the unique flavours of the mash, there were no other choices. It was either more mash or peas as a second option and I hate peas. Maybe a mixed veg selection would be a good addition. In no time at all, my pie arrived with a heap of mustard mash and a jug of thick gravy. The crust was gluten free and thick and as I sliced my knife into it, it crumbled effortlessly. I poured masses of the gravy over the steaming, generous filling. The mash was fluffy and creamy with a gentle mustard flavour that didn’t over power. The gravy was beautifully rich. The BBQ pulled pork filling was gorgeous with plentiful heaps of meat. It was so tasty and moreish and underneath was a pork crackling base. This was a nice touch but I can’t help but think that it would have been better as a topping. Being underneath had made it unbearably chewy so I left it for the well-being of my teeth. I devoured every bit. 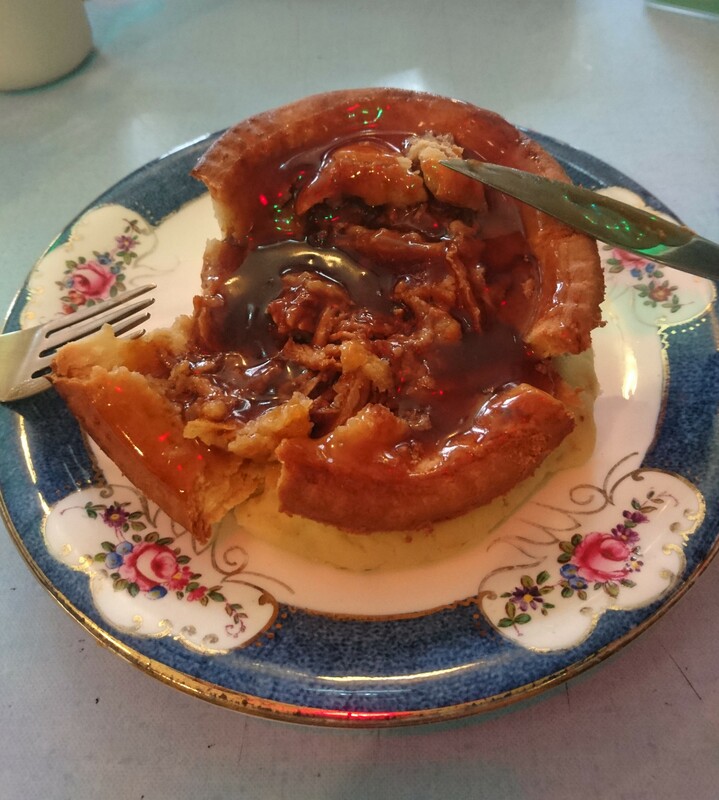 It wasn’t too heavy on the stomach or greasy like most pies and eating it was a genuinely enjoyable experience. I passed on dessert as there was nothing that really took my fancy. There were only three choices available. There was a plum Frangipane and a cinnamon bun swirl pie but almonds and cinnamon are the two things I can’t stand. The third option was St Jude’s ice cream in vanilla, passion fruit and white choc and raspberry fudge swirl flavours. I didn’t mind this option but it was nothing special so I paid my affordable bill and went out to enjoy the rest of my day. The comments were right about Pie and Vinyl and they successfully put their money where their mouth is. It has definitely secured itself a position in my Top 5 on my Southsea Food Tour.